With only a little over 2,000 pilots having received the award since inception, the Federal Aviation Administration's Wright Brothers Master Pilot Award is perhaps one of the highest acknowledgements a pilot can receive and is the most prestigious award the FAA issues. Held in high regard, the award is bestowed only to pilots having practiced continuous safe flight operations for 50 years or more – recognizing their professionalism, skill, and aviation expertise. The criteria for those being nominated for the Master Pilot Award is stringent. Nominees are required to be recommended by fellow certificated pilots, who can attest to their career record of conducting consistent professional and safe flight operations. With few pilots having had aviation careers greater than 50 years and even fewer having such an immaculate and impeccable record for that length of time, the Master Pilot Award is a true testament to the recipient's mastery of flight, professionalism, safety-centric focus, and demonstrated technical skill and knowledge as a long-standing certificated pilot. It comes with great honor in which we announce that on July 6, 2015, ATP Higher Power Aviation's very own Captain Michael Vance, was presented with the Wright Brothers Master Pilot Award by the FAA. A retired Boeing 737 Captain for America West Airlines, Michael Vance has continually demonstrated his commitment towards promoting safe and professional flight operations throughout his illustrious career, which started with him working as a US Air Force Air Traffic Controller before moving on to log over 20,000 hours as an airline pilot. Michael Vance started his journey into aviation with his first solo at the age of 15, following in the footsteps of his father, who flew bombers during the second world war. With the end goal being an airline pilot, Michael joined Rio Airways as a first officer in 1977, where he flew the BE-99, DHC-6 and DHC-7. His perseverance and strong commitment towards professionalism and safety, allowed him to quickly upgrade to captain after only one year, before eventually moving on to a 20 year career with America West Airlines, flying the line as a Boeing 737 Captain. Recognizing his ability to lead and effectively instruct others to the same high standards he personally holds himself to, Michael performed additional duties with America West as a Training Captain and ground school instructor. After a long and successful career with the airlines, Michael retired in 2004. Not giving up on his passion for aviation and desire to teach fellow pilots to be the best they can be, Michael continued instructing, joining ATP Higher Power Aviation’s Boeing 737 initial and recurrent training programs as a Training Center Evaluator. While his countless flights with the airlines, transporting hundreds of thousands of passengers safely, would be enough to make any pilot proud, Michael cites his involvement with the Commemorative Air Force as one of his most fulfilling moments in aviation. For it is here where he had the opportunity to not only fly the same aircraft his father flew during the war, but also share the cockpit with many famous veterans who served our country during that time, including most notably Paul Tibbets. 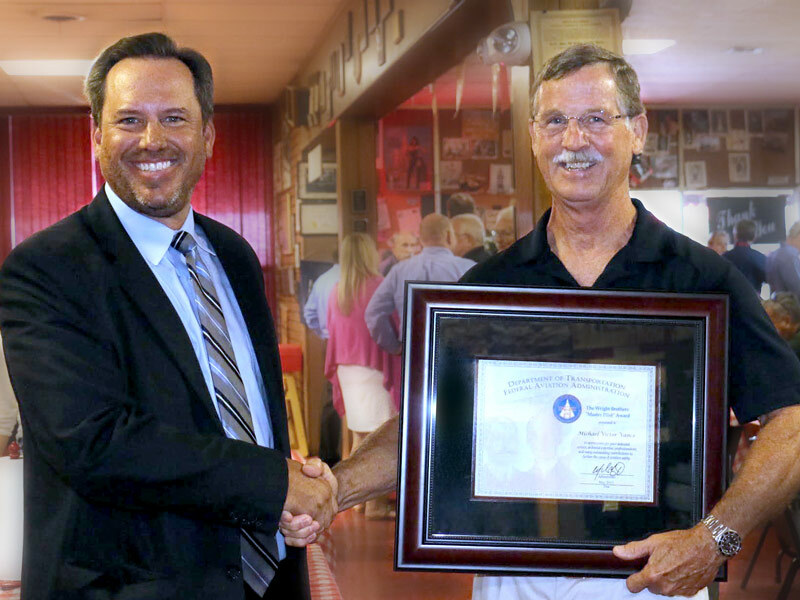 Acknowledging his extensive career and mastery as a professional pilot, the FAA awarded Michael Vance with the honor, who now imparts his depth of knowledge and vast aviation experience as a Training Center Evaluator for ATP Higher Power Aviation in Dallas, TX. "Michael epitomizes pilot professionalism and his focus on fostering a culture of safety within the aviation community is something in which serves as an example for fellow pilots to aspire towards," said Phil Cooper, President of ATP Higher Power Aviation, speaking of the achievement. "We are honored to have Michael be apart of the ATP family. His career-demonstrated traits of safety, professionalism, skill, passion, and ability to promote those same attributes within others, is something we are very proud of and is a strong reflection of what we instill within ATP students throughout their training programs." As a Training Center Evaluator with ATP Higher Power Aviation, Michael Vance actively works with students in ATP's Boeing 737 initial type rating and recurrent programs. Having been involved with the 737 program for nearly 10 years, Michael's list of career accomplishments continues to grow, as he conveys his wealth of experience and disciplined approach towards aviation professionalism to ATP students.